"Long ago, in a galaxy far away..."
Galaxies are collections of stars such as our own Milky Way. There are basically two types of galaxies, spiral and elliptic. There are also a smaller number of galaxies with irregular shapes. Spiral galaxies usually consist of a spherically symmetric centre with a small extension compared to the whole galaxy. In addition they consist of a disc in which the stars are situated in spiral arms. In many cases there are also large amounts of gas in the galaxy. In some regions the concentration of gas is high enough for new stars to be formed. Some of these spiral galaxies have a very large amount of matter in the center and even more matter is "sucked" in from the outer parts. 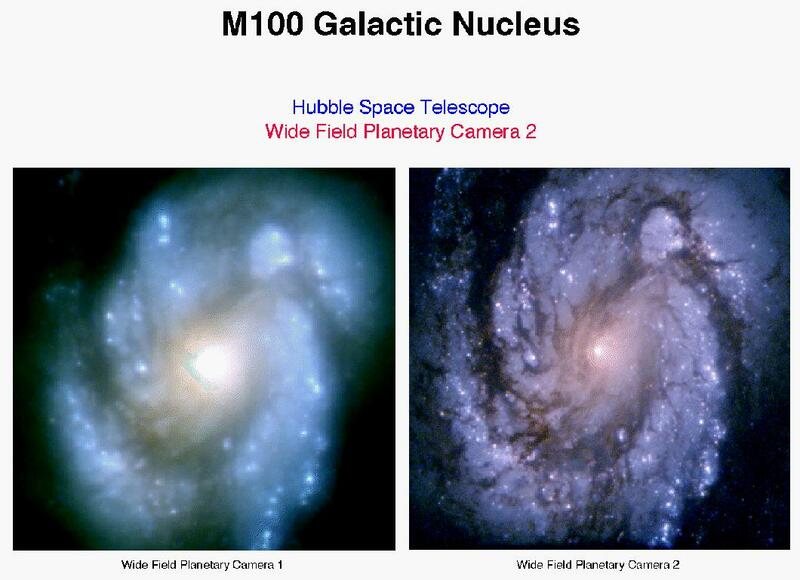 Such galaxies are said to have active galactic nuclei. One thinks that the amount of matter in the centre may even be so large that black holes can be formed. 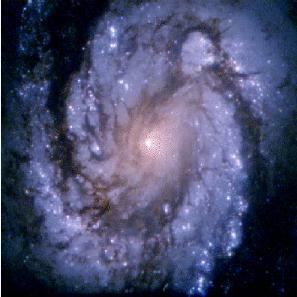 The spiral galaxy M100 in the Virgo-cluster photographed by the Hubble Space Telescope. The other type of galaxies are so called elliptic galaxies. These have a more uniform distribution of stars and are almost completely void of gas. In contrast to the spiral galaxies, there is no production of new stars in these galaxies, and therefore they only contain older stars. Individual galaxies of both types usually belong to systems of galaxies, so called clusters of galaxies.